There is a road between here & nowhere. It cuts a path through a barren landscape that is inhospitable to most. Yet despite the environmental adversity the thumbprint of man is still evident. The tranquil desert scenery bears the scars of industrialization, man made blights and failed urban development. The horizon is punctuated with haunting skeletal remains of abandoned attempts to inhabit this arid environment. Questions arise of how these artifacts came to be and the stories behind them. The views from the empty homes can be seen as both beautiful and condemning. Telephone poles and asphalt are the only active reminders of civilized life here on the fringe of society. This is modern archeology along a road of broken dreams. 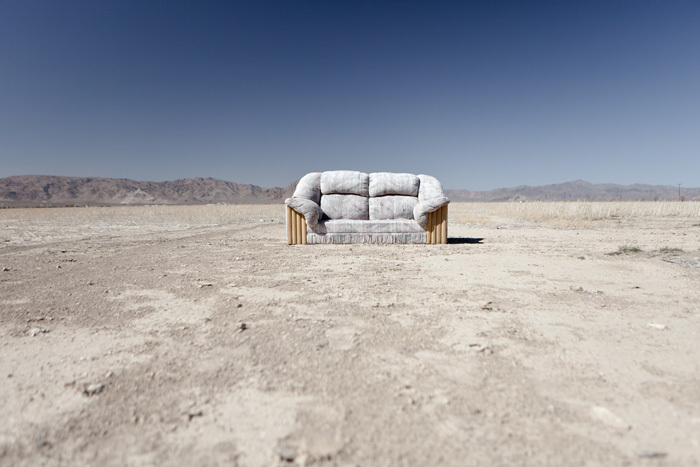 Between Here & Nowhere is an ongoing series based upon my years of exploring the deserts of Southern California. I was initially inspired to photograph the natural beauty beyond the concrete sprawl of Los Angeles, but my motivation soon changed once I ventured far enough. Upon discovering the rural decay scattered throughout the Mojave Desert to the toxic shores of the man-made Salton Sea, I became focused on documenting the ways mankind had altered this environment. In my eyes, I see the artifacts as symbols of man's basic needs and the applied ambitions to flee urban trappings. However this story is not just about loss and the toll society takes on our surroundings. For every change we make to the landscape, nature will adapt to and ultimately the processes of entropy and evolution will thrive. In the end we are just visitors passing through and these are the marks we leave behind. Clay Lipsky is a Los Angeles, California based artist.